I know I’ve been away for an awfully long time. I’ve been extremely busy trying to get a(ny) company convinced that I’m fit to work for them, with varied results. Ok, enough said about that. On to today’s post. There are disputes over the Arohana and the Avarohana — some use Daivatha while ascending (arohana). There’s also the case where Rishabha is not used in the Arohana. The jeeva swara(s) are R, M and G. To a large extent it’s the Rishabha that gives this raga its identity more than the Gandhara or the Madhyama. I had written about the association of ragas and the expression each one evokes. Nattai evokes the Veera Rasa. The essence of the raga is in how its sung — generally fast paced and hence, acts like a wake up call for the listeners — and this is why Nattai is generally used to begin a concert to set the tone for the rest of the kutcheri to follow. As is required by other ragas, Nattai requires strong lung power at the lower notes — lower Nishadha and Rishabha are quite common in its prayogas. And hence, it is a Ghana (lit. strong/heavy) raga. This is the reason why Thyagaraja chose Nattai as the first of his five Ghana Ragas to compose the Pancharatnas (lit. Five Pearls). The others, ofcourse, being Gowla, Arabhi, Varali and Sri. 1. Remember the scene in Anniyan when the family goes to Thiruvaiyyar to attend the Thyagaraja Aradhana? The shot shows Sudha Raghunathan and a host of other singers singing Jagadananda karaka in, you guessed it, Nattai. This song, as you may know, forms a part of the famous Pancharatna Kritis composed by Thyagaraja. 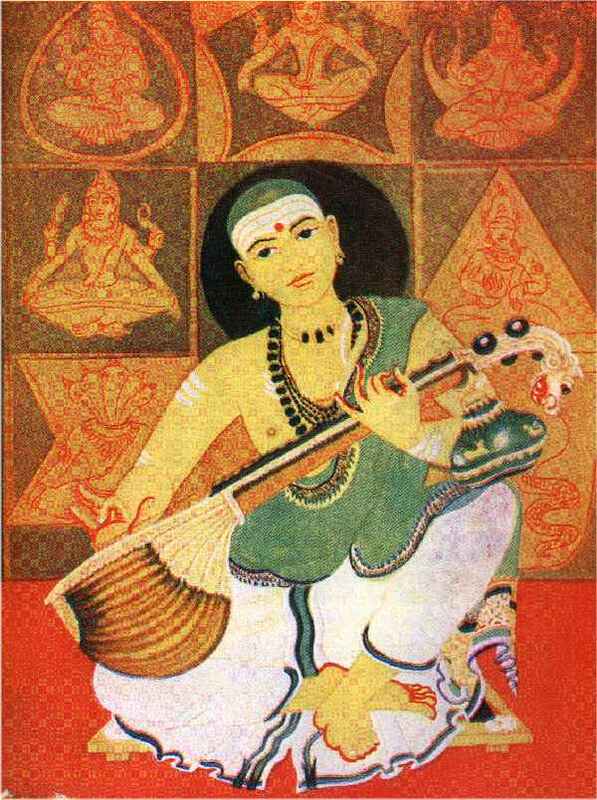 Thyagaraja was a devout follower of Lord Rama and most of his compositions are in praise of Rama. In this particular kriti, Thyagaraja eulogizes Rama as one who is the cause of all bliss in the universe. This is the only pancharatna kriti that was composed in Sanskrit. All the other kritis were composed in Telugu, which was used in the court of the Maratha king Sarabhoji who ruled this area in the 18th century. Thyagaraja uses S R G in the Arohana in this composition. If you have a look at the Chittai Swaram(s) of the kriti you can for yourself verify the usage of S R G.
2. Swaminatha Paripalaya – Muthuswamy Dikshitar. In this song, the composer praises the lord Muruga and his 2 wives Valli and Devayani. Muthuswamy Dikshitar School does not use Rishabha while ascending in this raga. However, in this particular kriti, the chittai swaram has a Rishabha being used between S and G, which is quite uncommon when it comes to Dikshitar’s kritis. It is, however, not known if Dikshitar himself added the R there or someone else modified the swarams this way. The latter is believed to be the case. Good post! One of my fav raagams… How about narumugaiye? Isn’t that song a blend of Naatai and Gambheera Naatai?